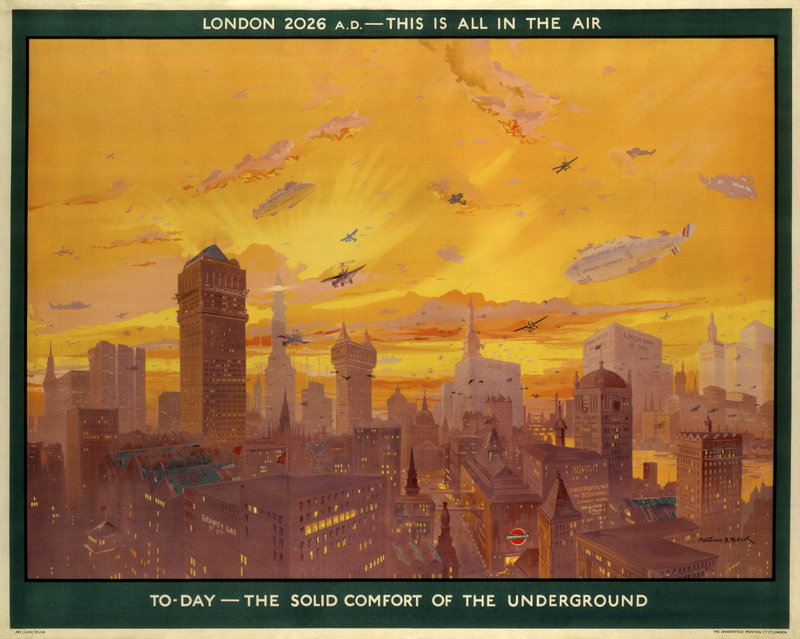 According to The Guardian, the poster is unique in its optimism—most images from the time period rendered future London as a frighteningly dark and dismal place. This is certainly a hopeful London (although I hope the yellow sky isn’t smog). I especially enjoy how Black took the opportunity to add a few skyscrapers to the horizon, which are fairly progressive in their boxy, modernist looks. The one with the green roof to the left looks remarkably similar to the Woolworth Building, which had just opened in New York City. Streets Ahead has some very compelling visions for how London streets will morph to meet the needs of its citizens, from bike highways to smart buses. Before you say that this vision of the future is almost definitely not going to happen by 2026—where’s my flying car?—let me offer a hypothesis. I’d like to think this particular painting predicts our drone-delivering future. Imagine these autonomous dirigibles with FedEx and Amazon logos, meaning no more trucks on the road, freeing up streets to move more people around via bike, bus, or Tube. Leave the shipping to the skies; it’s still far more reliable to get around underground. If you’re in London the show is up through February 24.